Home » NEWS » COPS INVOLVED IN US EMBASSY INCIDENT HAD BEEN RELIEVE? MUST READ!!! COPS INVOLVED IN US EMBASSY INCIDENT HAD BEEN RELIEVE? MUST READ!!! Philippine National Police (PNP) Director General Ronald de la Rosa expressed dismay over the violent dispersal of protesters outside the US Embassy yesterday Wednesday and vowed to have the incident investigated. In a statement read by PNP spokesperson Senior Supt. Dionardo Carlos at a press conference, Dela Rosa said he has seen the video. “Napanood ko ang video at nakakalungkot at nakakagalit. I saw people that got hurt. Ayaw na ayaw ko na may nasasaktan na Pilipino,” he said. Nevertheless, he said, it is his duty and moral obligation to "look into this squarely" and "act on it decisively and swiftly." The police force, he emphasized, "recognizes and upholds the citizens’ right to peaceful assembly," and were tasked to "exercise maximum tolerance in such public assemblies, with public safety and protection of human life an utmost concern and topmost priority,” he said. "With what transpired at Roxas Boulevard in Ermita, Manila yesterday, an investigation and the full review is underway and necessary sanctions will be levied on any personnel guilty of putting lives at risk," he added. 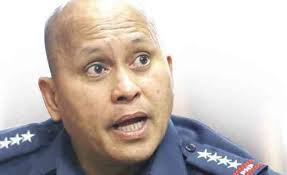 Dela Rosa said he has instructed National Capital Region Police Director Chief Supt. Oscar Albayalde to place all officers involved in the police operation under administrative relief "to ensure utmost impartiality of the investigation." "Our other priority now is to look into the victims, and check on their recovery and safety after such an unfortunate incident," he said. In Albayalde's official statement, he said the skirmish resulted in injuries to 35 policemen, 22 protesters, as well as damaged police vehicles "when protesters attempted to forcefully overturn it." In the press conference Thursday, Police Director Benjamin Magalong confirmed that the nine officers, who included Manila Police District Deputy Director for Operations Senior Supt. Marcelino Pedrozo, and Police Officer Franklin Kho, who was driving the mobile, were placed in "restrictive custody." Magalong maintained that they will not only look into Kho's running over the activists but the process as a whole. He added that the investigation has been turned over to the Philippine National Police (PNP) Criminal Investigation and Detection Group (CIDG). "Lahat na ng ongoing investigation ng NCRPO will be terminated; CIDG will take over. Kagabi, andun na yung CIDG getting all the pieces of evidence," he said. "The PNP is now piecing together all facts and circumstances between members of the Manila Police district and a group of militant activists in Ermita, Manila this morning," the PNP said in a statement. All injured parties, from both the militant activists and police, were given proper medical attention, the statement read. "It is unfortunate that some persons were reported hurt in the confrontation that allegedly began when the much bigger group of militant activists broke into the smaller defensive formation of the MPD (Manila Police District) Civil Disturbance Management contingent that stood its ground to prevent an escalation of violence," the PNP said. Social Welfare Secretary Judy Taguiwalo has called on the MPD to immediately release the arrested protesters. At least 29 members of indigenous peoples groups, including two Lumad minors, two girls aged 15 and 14, were arrested during the rally outside the US Embassy in Manila. The National Capital Region Police Office (NCRPO) of the Philippine National Police (PNP) on Thursday said police officials involved in the violent dispersal of protesters outside the American Embassy were ordered administrative relief. In a radio interview, NCRPO director Chief Superintendent Oscar Albayalde said nine officials of the Manila Police District were relieved from office, including Senior Superintendent Marcelino Pedrozo, whom the witnesses heard to be directing the dispersal of rallies. Pedrozo reportedly denied the claims that he issued the dispersal order. The cop driver of the police van, identified as PO3 Franklin Kho, is now under the custody of the NCRPO. Albayalde explained that the police force including Kho did not expect the protesters would turn violent. Kho was then forced to remove the police mobile as it was allegedly being shaken and attacked by the protesters. “Ang initial explanation sa atin is 'yung nakita kasi ng ating pulis na niyuyugyog at pinupukpok na 'yung sasakyan na 'yun so 'yung driver, to extricate 'yung mobile na 'yun, pumunta siya, tumakbo siya sa sasakyan kasi initially wala siya doon sa loob ng sasakyan. Noong tumakbo siya papunta doon sa sasakyan, hinabol siya ng mga raliyista. Natakot siya na baka siya ang masaktan. Pagpasok niya sa mobile na 'yun, pinagpupukpok 'yung mobile nila,” Albayalde narrated in a radio interview. “Minabuti niya na ilabas o extricate 'yung sasakyan na 'yun, but on the process, may nagsasagaan nga dahil hindi siya nakarating nang diretso kung saan siya pupunta,” he added. “Sisiguraduhin natin na mananagot 'yung mga pulis na involved doon kung saan makikita natin na there was excessive use of force,” Albayalde said. The PNP assured the public that the criminal and civil liabilities of all personalities from both sides involved in the violent incident will be identified. In Duterte Administration I saw that everyone deserve a fair justice. No is above the law, Whatever the real reason behind that police mobile who is repeatedly ramming the protester as it drives wildly back and forth that resulted in several bloodied, as an anti-US rally turned violent.